Summer Tales is here! Right on cue for the summer holidays and it would make a fantastic ‘beach read’ or a ‘relaxing in the garden’ read. This is the third anthology of seasonal short stories from Ruler’s Wit, following on from Winter Tales and Spring Tales. 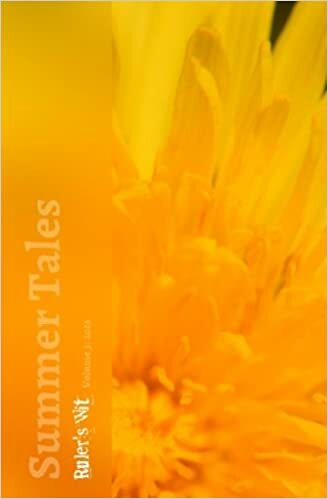 Summer Tales has been written by the same four authors: Stephen Ashurst, Karen Ette, Melinda Ingram and Donna Shepherd plus a welcome, new addition - K. D. Parker who has only recently joined Ruler's Wit and so this is her debut appearance in their publications. The fourteen stories all have a summer setting, which brings them together in a united theme, but each one is very different from the others. Some of the characters from Winter Tales and Spring Tales take up new adventures as the seasons change. The first five stories all have a different, well-known saying as their title and the book opens with a dark but hilarious tale, If You Can’t Stand the Heat, – you’ll never see Blackpool in the same way again. At the Going Down of the Sun is set in July 1916 and the Battle of the Somme. It is fact-based fiction written from the unpublished diaries of a stretcher-bearer and a nurse. Sign of the Times is a fascinating time-slip story, and is again fact-based fiction set around Salcombe’s South Sands. In All that Glitters you can find out who Alistair’s group of friends are and what he discovers. Life on a Silver Spoon shows how manipulative those in debt can be, and tells of one young lady’s plan to embark on life on a silver spoon. Someone Who Cares will keep you on tenterhooks; it’s dark, it’s disturbing, and only two people can prevent devastation. Scratchcards, however, is lighter and tells of a hot summer’s night in a village community, with a twist. A Bloody Good Innings is a beautifully written story that made me cry; I’ll say no more other than ‘it’s been emotional’. Back to the dark side with Excess Baggage – can relationships from a one-time meeting last? Fasten your seatbelts for take off! If you have read Spring Tales you will recognise the characters in this fast-paced story, First Stop Venice. When tragedy strikes, a good friend will be there and take you on a holiday to remember. More familiar characters continue their escapades in Far From Here (part 2). This Sci-fi adventure will make you smile, but there is a worrying element as to how on earth they are going to get out of this situation. Cape Reinga is set in New Zealand, blending Maori culture and legend in this fictional tale. Little Cuts of Film is another story based on accurate facts of the war in Iraq in July 2007. The last story, He Said What? is about two friends who live in different continents, but care so much for each other that drastic action has to be taken. Summer Tales is available from Amazon in both paperback and Kindle.